BACKGROUND: Adverse drug reaction (ADR) is a noxious, unintended effect of the drug which may occur due to pharmacotherapy of the disease. Bipolar disorder is a chronic mental illness represented by mania, depression and cyclic episode. The treatment of Bipolar disorder is lifelong. Hence, there are increased chances of ADRs. METHODOLOGY: An observational, prospective study was performed on 286 patients, to identify, monitor, and resolve the ADR with bipolar disorder patients. The patients aged 18–65 years of either gender or diagnosed with bipolar disorder were enrolled in the study. Patient-related data had been collected from the patient record; probability of ADR was measured by Naranjo scale and severity by Hartwig scale. Descriptive statistics had been used for study data interpretation. RESULTS: A total of 286 patients were enrolled in the study, of which 27 patients suspected with ADR. 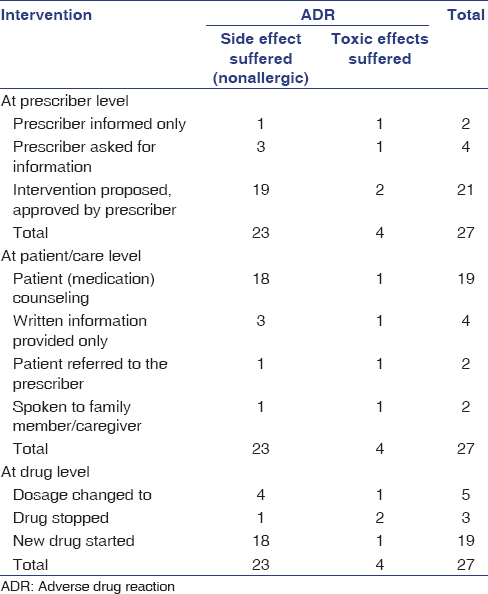 Among all the ADR, nonallergic side effect suffered ADR were 88.1%. Of which, the most common ADR were hand tremor and hypothyroidism, which were associated with lithium (81.4%) followed by valproate (11.1%). On causality assessment, 44.4% cases were probable and possible. In most cases, severity of ADR was founded at Level III with 74.7% and Level II with 25.9%. The rate of acceptance of pharmacist intervention by a psychiatrist has been found to be 74.7%. The major cause of ADR was a drug/dose selection (74.07%). CONCLUSION: ADRs occur most frequently in bipolar disorder. The incidence of drug-related noxious effect can be minimized by the prior identification, monitoring, and reporting. Thus, the clinical pharmacist can play a key role in pharmacovigilance of ADR. Drug is the active chemical entity which is present in the dosage form for the pharmacotherapy of the patients. The drug response variability from person to person is the major problem of the pharmacological treatment in clinical practice; it can be a therapeutic failure or adverse drug reaction (ADR) in individual or in clusters., ADR is the leading cause of morbidity and mortality. The worldwide approximately 5% adult and 3% pediatric hospital admissions are the result of ADR. In India, around 5%–20% patients experience ADR as a result, of which 10% hospital admissions occur every year. As per the World Health Organization, ADR is “Any response of drug which is noxious and unintended and which occurs at dose normally used in human for prophylaxis, diagnosis, or therapy of disease or for the modification of physiological function.”, The monitoring of ADR has been done under the pharmacovigilance program in India (PVPI) runs under the Central Drugs Standard Control Organization. PV is the pharmacological science related to collection, detection, assessment, monitoring, and prevention of ADR and drug-related problems (DRPs). PV is still in infancy and ADR reporting system is below 1% in India against the world rate of 5%. Bipolar disorder is a severe, recurrent, and chronic mental suffering, which may represent by the mood swings such as dysthymia, depression, euphoria, cyclothymia, and mania at different time of interval in the same patient with significant functional and cognitive impairment. Pharmacotherapy for bipolar disorder is frequently associated with ADR because of its lifelong treatment which impairs the patient quality of life. Hence, multidisciplinary collaboration of health-care professionals such as a clinical pharmacist, psychiatrist, and nurse is needed to optimize the patients' pharmacotherapy for the safety of patients from ADR. In the present study, efforts were made to encourage the pharmacovigilance program in India. The aim of our study is to monitor, identified, and resolve the ADR associated with patients with bipolar disorder through clinical pharmacist lead collaborative approach. 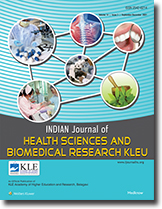 The study was reviewed and approved by the Institutional Ethics Committee (IEC) (KLEU/Ethics/2015–16/D-93); the study-related documents include protocol, patient data collection form, patient information sheet, informed consent form, and patient information leaflets which were prepared in local language (Kannada, Marathi, and Hindi) and submitted and presented to ethics committee before the study presentation in front of the ethics committee. The study protocol and procedure were explained orally. The study was conducted in 2400-bedded tertiary care hospital at the Department of Psychiatry over a period of 1 year from March 2015 to March 2016 after obtaining the IEC approval. It was prospective, observational study with 286 enrolled patients, those were fulfilled the study criteria like aged between 18 and 65 years of either gender and diagnosed with the bipolar disorder as per the Diagnostic and Statistical Manual of Mental Disorders (DSM-V). Patient with other comorbid psychiatry problem, lactating mothers, and pregnant women were excluded from the study. Patients those fulfilled the above-cited criteria were enrolled in the study. Enrolled patients were followed for 1-year duration, in which the four observations have been proposed (each observation gap was 3 months). Initially, the patient's demographic data, the chief complaint, past medical and medication history, and a current treatment plan with a drug information were collected at the baseline from the patient records. During the study period, the ADR has been identified and resolved through clinical discussion with the psychiatrist here clinical pharmacist assessed the ADR and reported it to the psychiatrist, the necessary correction has been made by psychiatrists, and ADRs were reported by a clinical pharmacist to PVPI. The type of ADR, clinical suggestions, causes, and outcome of ADR have been collected in the ADR documentation form and pharmacist intervention form. Probability of ADR has been assessed by a Naranjo Probability Assessment Scale which relates the list of questionnaires, which consist information of drug administration and event occurrence, alternative causes for the event, drug levels, dose–response relationships, and previous patient experience with the medication. The severity of ADR has been assessed by Hartwig's Severity Assessment Scale which is a list of questionnaires related to ADE. Hartwig's scale consists of seven different levels. Among them, Level 1 represents the mild severity of ADR and Level 7 represents the chronic severity of ADR. This scale consists information of suspected drugs, dose, dose change, length of hospital stay, alternative treatment, intensive medical care, and the patient's condition. DRPs have been monitored, identified, assessed, and analyzed on a daily basis as per the Pharmaceutical Care Network Europe (PCNE) classification of the drug-related problem's version 5.01. This classification is used to assess the nature, prevalence, incidence of DRPs, and also acts as an indicator of pharmaceutical care outcome. The data of the study have been segregated and analyzed with the help of IBM SPSS Statistics 20 (IBM Corporation, United State). Presentation of results such as demographic data and severity of ADR, causality assessment, and outcome assessment was done using descriptive statistics. The sample size of the study was decided with the help of patient flow at the Department of Psychiatry and journal of the previous study. The study was conducted at the Department of Psychiatry of Tertiary Care Hospital. A total of 286 patients were included in the study after taking their and legally acceptable representative a signed consent. It was observed that the male (61.2%) was more prevalent than female (38.8%), aged less than 30 years enrolled in the study. As per collected data, maximum patients were married (75.9%). Among the patients, approximately 86.7% did not have any family history and approximately 90% patients did not have childhood adversity. The patient-related demographic data have been mentioned below [Table 1]. All the selected patients were receiving their treatment as per the DSM-V, of which patients received valproate 9.7% (n = 43), lithium 50% (n = 223), sertraline 0.9% (n = 04), chlorpromazine 1.3% (n = 06), aripiprazole 2.0% (n = 09), olanzapine 20.7% (n = 92), quetiapine 13.0% (n = 58), trifluoperazine 9.2% (n = 41), trihexyphenidyl 10.8% (n = 48), haloperidol 3.6% (n = 16), divalproex 2.9% (n = 13), risperidone 4.2% (n = 19), lorazepam 15.5% (n = 69), and alprazolam 0.4% (n = 02). 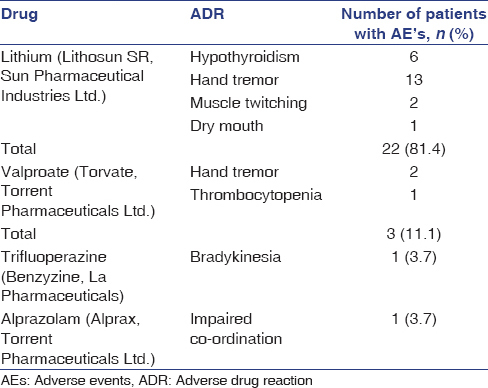 Majority of ADR had been associated with lithium 22 (81.4%) (Lithosun and Lithosun SR, Sun Pharmaceutical Industries Ltd.,) of which 13 patients suffered from hand tremor, 6 with hypothyroidism, 2 with facial muscle twitching, and 1with dry mouth. After the lithium, most of the patients reacted with valproate (Torvate, Torrent Pharmaceuticals Ltd.,)-induced ADR followed by trifluoperazine (Benzyzine, La Pharmaceuticals) and alprazolam (Alprax Torrent Pharmaceuticals Ltd.,). The detail of ADR has been summarized in [Table 2] and [Figure 1]. The ADR selection and classification have been done as per the PCNE classification, of which 88.81% (n = 24) were nonallergic side effect suffered and 11.19% (n = 03) were allergic side effect suffered. The probability or causality had been assessed by the Naranjo Probability Assessment Scale in four categories, of which 3.70% (n = 1) were doubtful, 44.4% (n = 12) were possible, 44.4% (n = 12) were probable, and 7.40% (n = 2) were definite. The severity has been assessed by Hartwig's Severity Assessment Scale, and the majority of severity were found at level III 74.07% (n = 20) followed by level II 25.92% (n = 7). The detail of Causality and severity assessment has been summarized in [Table 3]. Intervention has been proposed at prescriber, patient, and drug level, In which at prescriber level, 77.7% of interventions which were proposed by clinical pharmacist, which, has been approved by the psychiatrist. At patient level, patient counseling and their family member counseling had been done by clinical pharmacist, and at drug level, new drug had been started 70.3% by a psychiatrist to patient those suffered with ADRs. As the outcome of pharmacist intervention, 51.8% problems were completely solved and 48.1% problems were partially solved. The proposed intervention is mentioned in [Table 4]. Monitoring of ADR in a psychiatric setting holds a special place of importance due to the less likely reporting of ADR. There is a need to robust the spontaneous ADR reporting system to improve the pharmacovigilance system in India. For the same, Shah et al. conducted a prospective study of ADR in patients with bipolar disorder. In this study, 180 patients were enrolled, of which 97.22% patients suffered from ADR which were as follows: asthenia (11.95%), sedation (10.24%), polyuria/polydipsia (10.10%), weight gain (9.25%), and hand tremors were most common assessed ADRs those were associated with lithium, valproate, olanzapine, and clozapine. In this study, the author assessed that the majority of ADRs were probable (56.33%), of which most of were not preventable (64.3%). They concluded that proper reporting of ADRs can help to minimize the drug-induced side effect. A similar study has been conducted by Harichandran et al. to assess 53 ADRs on 31 patients of the psychiatry department. The psychotropic drugs such as olanzapine, risperidone, and clozapine were the major suspected drugs for the ADR. 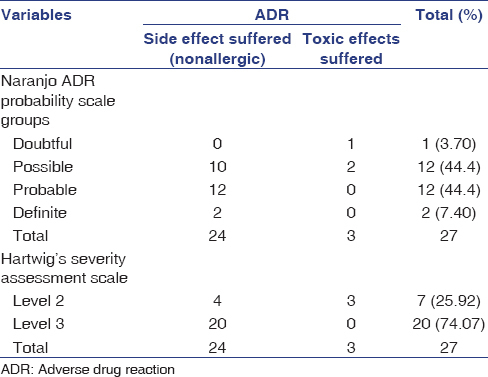 The author assessed that most of ADR were dose-dependent and predictable. Khoda et al. have monitored and reported the adverse events (AEs) of 32 psychiatric patients, of which they have found a 79.31% incidence in AEs among the psychiatric population. As per the results, the author concluded that effective monitoring by a clinical pharmacist can help to minimize the incidence of AEs and Ujwala et al. monitored and reported 92 ADRs of patients with psychiatric conditions, of which overall incidence rate of ADRs was 6.41%. Among all the patients, most common ADRs were tremor (13.04%), somnolence (11.95%), and constipation (9.7%). A majority of ADRs was associated with antipsychotic (46%), an antidepressant (29%), and antiepileptic drugs (12%), of which most of cases were probable and 80.4% were mild. The conclusion of these all previous studies gives us insight that proper spontaneous reporting of ADR by a clinical pharmacist, psychiatrist, patients, and other health-care professionals can enhance the pharmacovigilance program. For the same, in our study, first, we tried to assess the causes of ADR, which we did not find in other studies. The causes of ADR had been assessed through the help of PCNE classification. We observed that the majority of ADR were caused due to drug/dose selection 74.07% (n = 20) and drug use process 25.92% (n = 7). Under the primary cause of drug/dose selection, 8.33% (n = 2) ADRs were occurring due to pharmacokinetics problem, 12.5% (n = 3) due to the requirement of synergistic and preventive drug, 33.3% (n = 8) ADRs occurred due to new symptom revealed, and 45.83% (n = 11) ADRs were occurring due to the manifested side effect of the drug. Under the secondary cause of ADRs drug use process, the most common problem was the unmonitored therapeutic drug level. For the assessed problem, clinical pharmacist proposed the intervention, the causes and problems were resolved with the help of a psychiatrist. Second, we were on the telephonic contact with the patients during follow-up as well as clinical pharmacists reinforced the medication-related knowledge for their better care or quality of life. As in our study, we also have many limitations, first, this is the unicentric study with a small sample size so we could not represent the incidence of ADR in the region. Second, due to mental stigma, it was difficult to control the attrition rate and follow-up of the patient. Third, many patients belonged to the poor socioeconomic background because of the same they were not able to check the therapeutic level of drugs and laboratory investigation report of the patients. The study suggested that clinical pharmacist intervention with the collaboration of psychiatrist and other health-care professionals can help minimize the burden of ADRs and its related problem in patients with bipolar disorder. The clinical pharmacist intervention is very important to maximize the drug-related safety and minimize the drug-related noxious effect, which ultimately promotes the patients' quality of life. The author would like to thank Department of Psychiatry, Jawaharlal Nehru Medical College, Belagavi; Dr. Prabhakar Kore, Hospital and Medical Research Centre, Belagavi; and Dr. Archna Patil and Dr. Anushree Deshpandey Assistant Professor, KLE College of Pharmacy, Belagavi, Karnataka, for their great support. Rohilla A, Yadav S. Adverse drug reactions: An overview. Int J Pharmacol Res 2013;3:10-2. Tarun W, Patil PA, Suresh VP. Monitoring adverse drug reactions in coronary thrombosis patients admitted to intensive cardiac care unit in a tertiary care hospital. Indian J Pharm Pract 2013;6:6-12. Peter JG, Mouton JP, Lehloenya RJ. Immune-mediated adverse drug reactions in South Africa. Curr Allergy Clin Immunol 2015;28:186-90. Chandrashekhar VM, Harikrishna A, Kumar P, Hemanthkumar N, Chandrakanth M. Adverse drug reaction monitoring and reporting at H.S.K hospital and research center-Bagalkot. Indian J Pharm Pract 2016;9:49-56. Edwards IR, Aronson JK. Adverse drug reactions: Definitions, diagnosis, and management. Lancet 2000;356:1255-9. Committee MADRA. Malaysian Guidelines for the Reporting and Monitoring. Natl Pharm Regul Agency; 2002. p. 1-17. Available from: http://www.npra.moh.my>Guidline_central. [Last accessed on 2018 Mar 28]. Suke SG, Kosta P, Negi H. Role of pharmacovigilance in india: An overview. Online J Public Health Inform 2015;7:e223. Kalaiselvan V, Thota P, Singh GN. Pharmacovigilance programme of india: Recent developments and future perspectives. Indian J Pharmacol 2016;48:624-8. Amit D, Rataboli PV. Adverse drug reaction (ADR) notification drop box: An easy way to report ADRs. Br J Clin Pharmacol 2008;66:723-4. Singh PA, Madiwalayya SG, Bheemsain T, Shashikala W. The impact of clinical pharmacist lead collaborative care on quality of life of the patients with bipolar disorder: A unicenter prospective, randomization study. Indian J Pharm Educ Res 2017;51:s129-35. Sierra P, Livianos L, Rojo L. Quality of life for patients with bipolar disorder: Relationship with clinical and demographic variables. Bipolar Disord 2005;7:159-65. García-Cortés M, Lucena MI, Pachkoria K, Borraz Y, Hidalgo R, Andrade RJ, et al. Evaluation of naranjo adverse drug reactions probability scale in causality assessment of drug-induced liver injury. Aliment Pharmacol Ther 2008;27:780-9. Petrova G, Stoimenova A, Dimitrova M, Kamusheva M, Petrova D, Georgiev O, et al. Assessment of the expectancy, seriousness and severity of adverse drug reactions reported for chronic obstructive pulmonary disease therapy. SAGE Open Med 2017;5:2050312117690404. Pharmaceutical Care Network Europe Foundation. PCNE Classification of drug-related problems. Tidsskr Nor Laegeforen 2007;127:3073-6. Shah A, Yadav PP, Chaudhari M, Vataliya A, Kantharia ND, Mehta R, et al. Aprospective study of adverse drug reactions in patients with bipolar disorder in psychiatry outpatient department of a tertiary care hospital. J Clin Diagn Res 2017;11:FC24-8. Harichandran D, Viswanathan M, Gangadhar R. Adverse drug reactions among hospitalized patients in psychiatry department in a tertiary care hospital. J Heal Res Rev 2016;3:77. Khoda DA, Ganachari MS, Wadhwa T, Walli S, Parihar B, Aggarwal A. Clinical pharmacist driven impact towards intensive monitoring and reporting of adverse drug events in psychiatric patients. J Pharmacovigil 2014;2:128. Gawali UP, Kesari HV, Gawand KS. Adverse drug reaction profile at psychiatry outpatient department of a tertiary care centre. Int J Basic Clin Pharm 2017;6:2428-33.